FGUP GosNIIAS metrological service is the Institute’s structural unit intended to ensure the uniformity of measurements according to the Federal law No 102-FZ “On Ensuring the Uniformity of Measurements”. GosNIIAS metrological service features measurement standards database, skilled and certified verification officers, regulatory documents and calibration facilities needed for measurement means calibration in accordance with the accreditation scope. GosNIIAS metrological service is authorized to conduct measurement means calibration. The Institute is deeply involved in the management and running of field and hardware-in-the-loop (HWIL) simulation aircraft testing. The metrological test support in terms of quality factor values, test item safety and compatibility of its parameters measured during tests with regulatory documents plays a key role in the verification of simulated environment fidelity and obtained information validity. 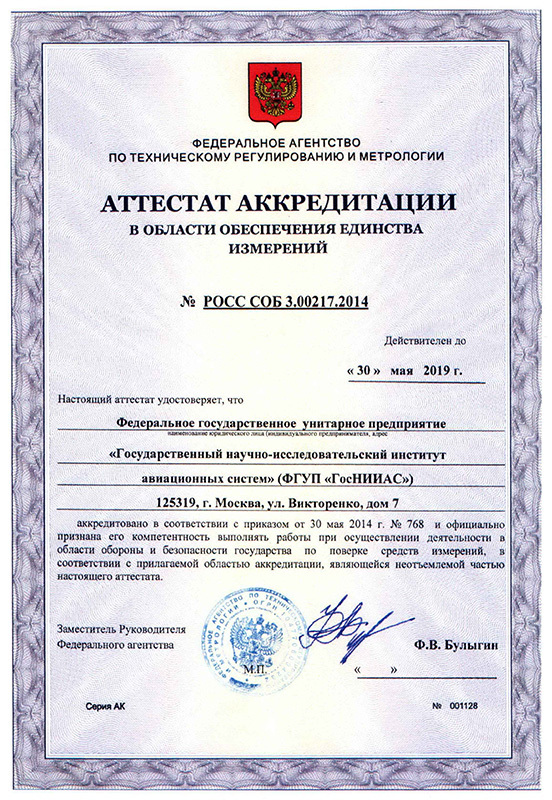 The metrological service in cooperation with GosNIIAS basic departments conducts a package of works on equipment and documentation preparation and personnel training for confirmation of the Institute capability to independently conduct measuring means initial certification and obtaining expert reports in compliance with GOST RV 0008-002-2013 requirements. The establishment of a special electrotechnical laboratory is planned for HWIL simulator power supply systems testing (acceptance, operational, diagnostic). In compliance with GOST R 54073-2010 “Aircraft power supply systems. General requirements and electrical power quality standards.” requirements power supply units must supply high-quality electrical power to HWIL simulator equipment. HWIL simulator power supply system must comply with fire and electrical safety requirements.